At the banquet in Big Piney, they told us that the trail here and in Kemmerer were going to be really tough and had a lot of drifting and deep snow. I was actually glad to hear this because my dogs are used to tough trails and do really well in those types of conditions. I knew that that they would be able to deal with these types of trails better than some of the faster teams. Another good thing was that these to stages were both supposed to be around 50 miles long. However, they ended up shortening both trails. For this Big Piney stage, the course was now only 27 miles. I was bummed to hear this since the fast teams would not loose as much time as they would have if the trail had been the original length, but I was looking forward to it anyway. I ran 9 dogs: Bella and Alice in lead, Emmett and Jasper in swing, Cessena, Khufu, and DiNozzo in team, and Kaycee and Ra in wheel. The dogs did awesome again and were just plowing through the deep snow and drifts like usual. The trail was great and beautiful, it was refreshing to be on a trail that I didn't have to ride the brake a lot to keep the dogs slowed down. 9 teams left in front of me, and I passed all but 3 on the trail. The run went by to fast, and I wish it would have been longer! I ended up finishing in 9th place overall. After feeding and checking over the team, we loaded up and headed to Kemmerer where we had another great meal. We made sure to get to our host family early since we would have to get up extra early the next morning for the long drive to the trail head. This trail would be about 45 miles, and I would again be leaving in about the middle of the teams. 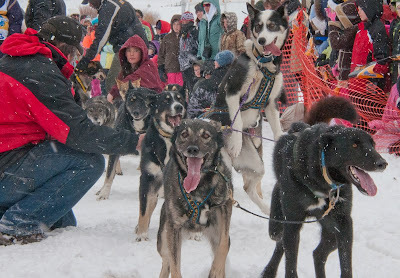 I ran 10 dogs again with Super Cub and McGee in lead, Bella and Alice in swing, Emmett, Jasper, Cessena, and Khufu in team, and Kaycee and Ra in wheel. The first part of the trail was across rolling fields, and the wind was blowing extremely hard. The wind had blown in the trail, so the first dog teams out had kind of made their own trail, which at times was very punchy. The wind eventually subsided and the rest of the trail to the turnaround was in pretty good shape. After turning around though, the wind picked up again with a vengeance and it began snowing. At times I could not even see the front four dogs on the team, and I definitely couldn't see the trail. I knew I could do nothing about it, so I just trusted the dogs to follow their noses and the trail. Despite the bad weather and visibility, I was actually pretty happy. I was a little worried about loosing the trail and getting lost, but I trusted fully in my dogs to get us back safely. We made it back in 9th place overall, and all the dogs were feeling good. We again loaded everyone up and headed down the road again. The next stage would be a 45 miles, and I would again be one of the first teams out on the trail. I had raced on part of this trail before in the Green River Classic races I had done, and knew the trail was mostly flat with a few short climbs in the middle. The temperatures were a lot cooler than they had been, and the trail was set up perfectly. 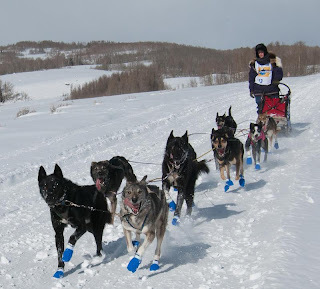 I ran 10 dogs again: Otter and McGee in lead, DiNozzo and Super Cub in swing, Cessena, Khufu, Embry, and Ziva in team, and Kaycee and Ra in wheel. The dogs did a lot better this day, and though we were still going slow, they seemed much more perky and excited. All the dogs did really well, and I was feeling great. About 6 miles from the finish, I could see that Embry was a little bit sore in her shoulder. I stopped and checked her over and decided to load her into the sled since we weren't that far from the finish and she was my lightest dog. 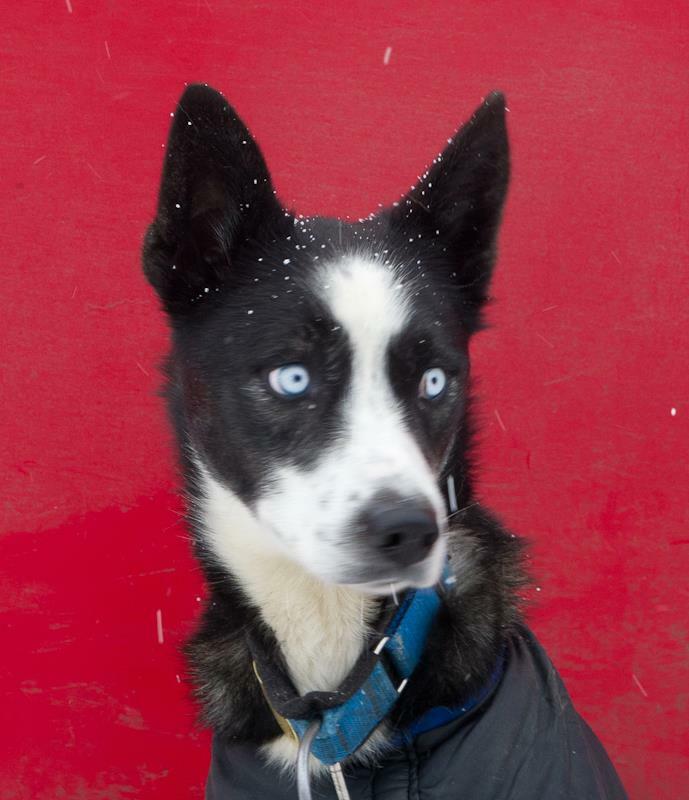 She had never ridden in the sled, and at first was being wild and trying to get out. She finally settled down and I zipped open the bag to check on her. 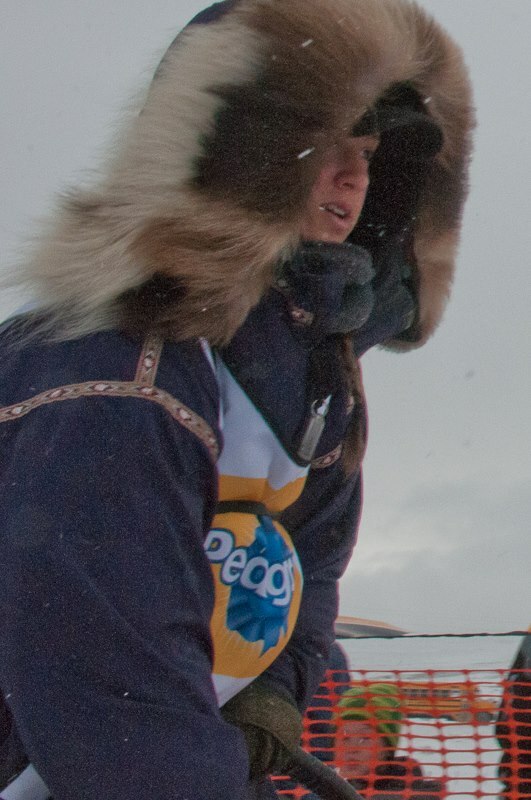 She was just laying there looking out the little window in the side of the sled bag, I could tell she was fascinated by the scenery. She was still and quite the rest of the way into the finish that I almost forgot that she was riding along in the bag. I finished second to last, but the quality of this run was way better than the first two, we were starting to make a comeback. Embry was fine, and we were going to let her have a couple days off just to be safe. All the other's ate and drank well before we loaded them into the trailer to head to yet another Wyoming town, Lander. There was no banquet or host families in Lander, so we got McDonald's that was across from our hotel before crashing for the night. The Lander stage was 42 miles long, and the trail was the fastest I have ever seen a trail. There was not much snow, so the trail was hard packed and fast. I ran 8 dogs for this stage since the trail was so perfect and the run was not that long. I ran Bella and Alice in lead, Emmett and Jasper in swing, McGee and Super Cub in team, and Kaycee and Quil in wheel. We were back and the dogs were fast and strong! I passed the teams that started in front of me and came across the finish line first. I ended up in 10th place overall, and was only 20 minutes behind the fastest team, even though I was the only one running only 8 dogs. We took care of the dogs, feeding and checking them over, and they were all feeling great. We loaded them into the trailer and headed to the next stop, Big Piney, WY. There we had a great banquet of home-cooked food and a good night's sleep at our host family's place. Saturday, we took off back to West Yellowstone where the first "real" stage of the race would begin the next morning. This stage would be about 55 miles from the start to the finish in Ashton, ID. The trail would climb up and over the Continental Divide, the border between Idaho and Montana. I was very much looking forward to this stage, because I knew my distance-style dogs would do very well on this steep and long stage. However, we went much, much slower than I ever thought. Some of the teams at the race, including mine, caught a little bit of a bug. It wasn't anything major, it just seemed to slow the dogs way down. After the first two miles down the trail, we slowed way down and did not speed up. It was snowing pretty hard, but luckily cleared up a little after we crossed over the divide. I just made my way down the trail. The only team behind me passed me and I didn't think I would pass anyone. About half way through the run, I did pass a team, which made me feel better, but I still knew it was a long ways to the finish. We eventually made it to the finish, and I did feel better after getting there. I wasn't as far behind as I thought I was going to be, and at least I wasn't last. The dogs all ate and drank fine afterwards and were happy. I was positive for the next stages, hoping that this was just a one-day funk. 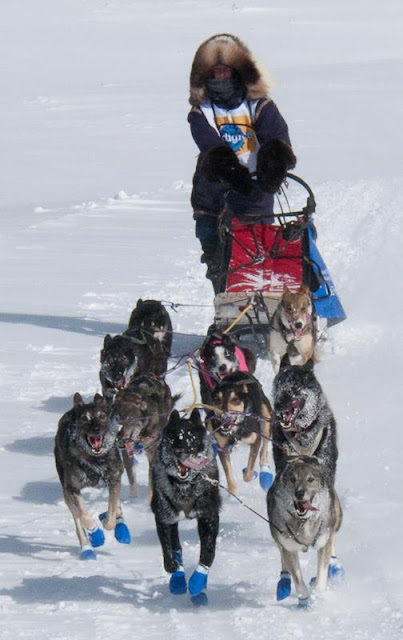 I ran a 10 dog team, with Alice and Bella in lead, Jasper and Emmett in swing, DiNozzo, McGee, Khufu, and Super Cub in team, and Kaycee and Ziva in wheel. The bright side was that all the dogs finished strong and no one had any injuries. After we took care of the team and put them back in the trailer, we began driving to Alpine, WY, where the night's banquet would be and the next stage. The drive was very long and hard because of the storm, but we made it to Alpine. After a good meal, we went to our host family to spend the night. Because the start order of each stage is the previous day's slowest to fastest teams, I was going to be second out. This stage was going to be the longest of the whole race at 60 miles. For this stage I was going to run a 10 dog team again, this time with the 6 dogs that didn't race the day before and 4 who did. Khufu and Super Cub would be my leaders, Otter and Cessena would be in swing, Jasper, Emmett, Quil, and Embry in team, and Ra and Paul in wheel. The weather was very nice for this leg, and the scenery was great. 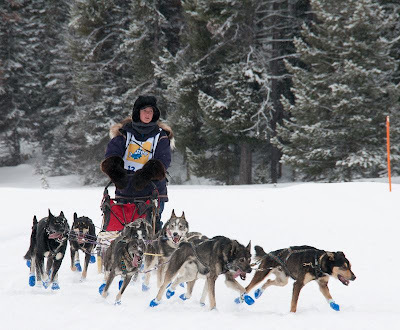 The dogs were still very slow and flat, but we did pass one team, and were third from last (moving up!). The trail was gentle rolling hills up to a turn around point where we headed back down the same trail. 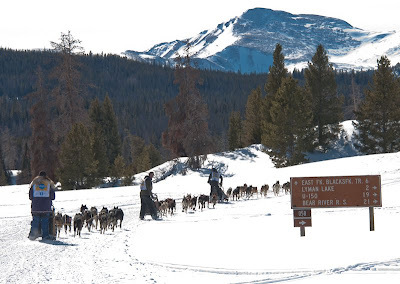 After coming across the finish line, we fed and took care of the dogs before loading them into the trailer to head for the next town, Pinedale, WY. 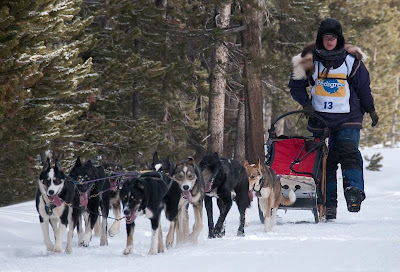 On the drive there, as I was telling Dad and Sydney about my run, they told me that race director, Frank Teasley, had taken all the handlers to pizza for lunch while there mushers were battling it out on the trail! At least I was hungry that night at the banquet in Pinedale, and afterwards, we went to our host family to rest up before the next stage. 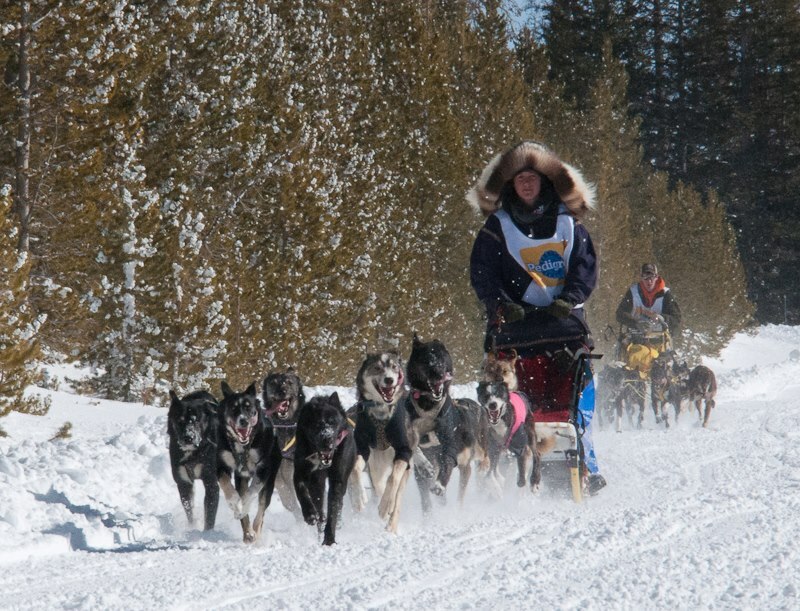 This year I had the great opportunity to compete in the International Pedigree Stage Stip Sled Dog Race, the biggest race in the lower 48. Mushers from around the country and around the world come to compete in this stage format race that goes through 4 states and 350 miles of trails in the Rocky Mountains. There would be a total of 8 stages during this year's race and 21 mushers. Dad and my cousin, Sydney, would be my handlers, and would take care of the dogs that were not racing when I was out on the trail and assist with taking care of all the dogs. The opening ceremonies kicked off on Friday night in the town of Jackson, Wyoming. We started Friday with the vet check and the mandatory musher meeting and bib draw. All 16 dogs passed their vet check with flying colors. 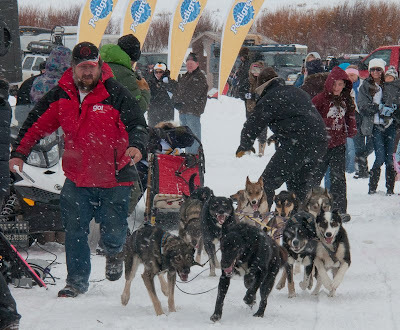 In this race you can have a pool of up to 16 dogs, and you can run up to 12 dogs each stage. My 16 dogs were: Bella, Alice, Jasper, Emmett, Otter, Super Cub, Kaycee, Khufu, Cessena, McGee, DiNozzo, Ziva, Paul, Quil, Ra, and Embry. After the vet check, we headed over to the location where the musher meeting would be. All the mushers had to sign the race banners that were to be used at each stage, and there were a ton of them, As I was signing the last couple of banners, I felt like my arm was going to fall off! After all the musher and their handlers had filed into the room, the meaning started. The rules were explained and questions were asked and answered. Our starting order for the night's ceremonial leg was drawn, and then we were free till that night. Of the whole entire race, this opening ceremony had me the most nervous. The leg is only about 2 or 3 miles long, and the course starts in the town square and heads down the city streets to the ski resort. Every year they truck in snow to put down on the streets. They do the same thing for some other races, including the Iditarod. I had never done such a thing, and did not know what to expect. We were only allowed to run 6 dogs on this stage, so I ran Bella and Alice in lead, Emmett and Jasper in swing, and DiNozzo and McGee in wheel. Though they are my 6 best behaved dogs, they also happen to be my 6 strongest and fastest dogs. I didn't really want to run the "big guns" on this trail, but they are the best about being calm if I have to stop, which I would at the end of the trail because the dog teams would be arriving at this finish before their trucks and handlers could get over there. 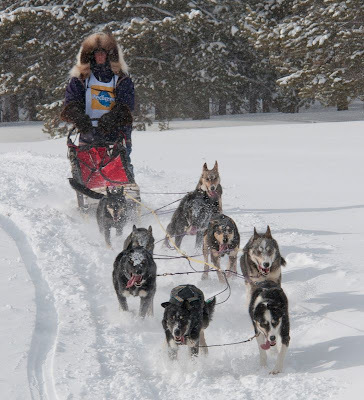 I made sure to put some meat snacks in my sled so I could give them to the team after we got to the finish, which was in a playground at the bottom of the ski hills at the Snow King Resort. I hoped this would convince the dogs that we were stopping for a while, even though we had only gone a very short ways. We had to take the team about 1/4 of a mile from the truck to the starting line at the town square, so I led the leaders while dad stood on the sled and brake. We got up to the start without a problem, and got into the starting shoot. They were doing dual-starts for this leg, so I would be starting at the same time as Dennis Laboda from Minnesota. I could see many people lined up and down the street and didn't really need my headlamp because of all the street lights. At this point I started to feel a little more excited and less nervous. The slowest team in this stage leaves first for the next stage, and the fastest team would leave last in the next stage. My plan was to be one of the faster teams, so I could leave further towards the back for the next stage starting in West Yellowstone. A lot of new snow was predicted for the night before the West Yellowstone stage, so I wanted to be starting as far back as I could so I wouldn't have to be breaking trail as much. With this strategy in mind, I let the dogs take off like a bullet out of the start chute. We made it out onto the trail before Dennis's team, and I tried to not ride the brake too much though it went against what I am used to doing. We flew down the trail, it all went by so fast. Before I knew it, we had arrived at the finish line. I stopped for a second there, and one of the volunteers offered to lead my team into the playground. I asked her to lead me up close to a sign post that I hooked with my snow hook. I got the dogs stopped, but they were still barking and pulling, wanting to keep going. I quickly got the snacks out of my sled and fed them to the dogs, and that helped as they decided that they must be in a checkpoint or something. The area was filled with dogs barking and screaming to keep running. At that point, looking around at all the teams being noisy and wild, I was glad that I had a distance team that was used to stopping at checkpoints. A couple skiers came up and talked to me while I waited for Sydney and Dad to arrive with the truck. They had to park a ways away, so we left Sydney with Bella, Alice, and the sled while Dad and I took Jasper, Emmett, McGee, and DiNozzo by the collars back to the truck. We came back and Dad and Sydney led Bella and Alice to the truck and I rode the sled. After getting the two girls unharnessed and put back in the trailer, we loaded the sled back unto the truck and went into one of the ski resort's buildings for the banquet. We ate dinner and watched the firework display that was put on for the race. While the fireworks were going off, Dad went to make sure the dogs were ok and not getting scared by the fireworks. He came back and told me that they didn't even care about them. We found out that Ryan Redington had the fastest time, and I had the second fastest time! This meant that I would be leaving second to last Sunday morning in West Yellowstone. Once all was said and done, we headed back to our friend's house where we would stay the night before driving to West on Saturday.